What I like about this recipe is that everything is cooked in one pot, making clean up a breeze. However, when rice is involved, it could get a little tricky. There are some rice dishes have a tendency to get gummy when overcooked or gritty when undercooked. And when it comes to jambalaya, when I've made it in the past on the stovetop, there's that potential for the bottom to get all burnt and crusty. For this recipe, the dish is baked and it ensures the rice won't scorch on the bottom. 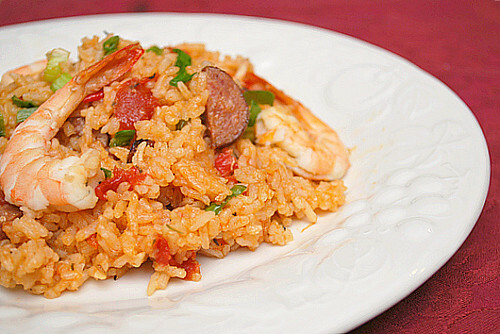 Another trick is that a piece of foil is placed directly on the surface of the rice before the jambalaya goes into the oven. The foil holds in the steam and heat far more effectively than the lid alone so that helps every grain of rice to cook perfectly. Also, if you can't find andouille sausage, you can substitute it with a polish sausage and add some cajun seasoning to taste for that extra kick of flavor. Heat the oil in a large Dutch oven over medium high heat until shimmering. Add the sausage and cook until browned. Using a slotted spoon or tongs, transfer the sausage to a paper towel lined plate. Add the shrimp to the same pot and cook until the shells are lightly browned on both sides, about a minute per side. Transfer the shrimp to a large bowl and refrigerate. Reduce the heat to medium and add the onion, celery, bell pepper, and garlic to the opt. Cook, stirring occasionally, until the vegetables have softened, about 5-10 minutes. Add the rice, tomato paste, salt and thyme and cook until the rice is coated with fat. Stir in the tomatoes, reserved tomato juice, clam juice, bay leaf, and sausage . Place a square of foil directly on the surface of the rice. Bring mixture to a boil, cover the pot, transfer to the oven, and bake in the preheated oven until the rice is almost tender and most of the liquid is absorbed, about 20 minutes. Meanwhile, peel and devein the shrimp and discard the shells. Remove the pot from the oven, lift off the foil, and gently stir in the peeled shrimp, and any accumulated juice. Replace the foil and lid, return the pot to the oven, and cook until the rice is fully tender and the shrimp are cooked through, about 5 minutes. Remove the pot from the oven, discard the foil and bay leaf, fold in the scallions, and serve immediately. Oh my goodness. I love jambalaya and Cook's Illustrated! Thanks for sharing. How funny, i made and posted a jambalya just a day before you, it must've felt like jambalaya season for us.